A pristine, well-equipped condo overlooking a hidden cove. Swim, snorkel, see turtles, reef fish and if the surf’s up, grab a board and hang 10! From the lanai watch dolphins and whales frolicing. Lovely furnishings and tropical art throughout. A king bed in the master suite and in the 2nd bedroom, the option of a king or twins. Make this secluded jewel your destination. A basket of local fresh fruit and goodies will welcome you on your arrival. See our 5-Star Reviews. Oceanfront Resort — Reviewers have said "Like walking in the Garden of Eden"
Twin/Single Bed (2) — May be converted to King Bed with advance request. Cooking Utensils Provided — Reviewers say "We had everything we'd ever want"
Blender — Many features - You'll love it! Absolutely stunning oceanview from balcony! My husband and I stayed in this unit as part of our honeymoon stay on the big island and the oceanview from the balcony was worth it alone! The condo was so clean and beautiful. It was only the two of us so was quite big for a 2 bedroom but we spent all our time on the beautiful balcony overlooking an ocean cove. We will definitely be back if were able to visit the big island again. Comfortable 2BR condo. As pictured. Loved the ocean view from lanai and living room. Had all the glassware, plates, etc. we needed. Towels lovely. Lots of space. Did not care for the carpet. Think there was a lot of dust/mold due to folks bringing in sand, etc. Both my daughter and I had a lot of allergy responses (runny nose/ itchy eyes) due to the mold/ dust. Would recommend it. Our week in 3601 was wonderful. Can’t beat the view from the deck, ocean and bay with entertaining birds and surfers. Immaculate and comfortable furnishings. Convenient, quiet location. We shall return! We truly enjoyed our stay in unit 3601 at Kanaloa at Kona. The location immediately inside the gate is very convenient. The view of the cove and sounds of the ocean were breathtaking! I'm glad we paid for the airconditioning, as it was pretty hot and humid and we would have been uncomfortable without it. The convenience of the nearby shopping center with several good restaurants and grocery store was really nice. Everything inside the condo was well maintained and we found everything we needed for trips to the beach, including some beach chairs and a cooler. My only feedback is that it might be time to get some new bath towels as they smell a little funky. There was an ample supply of extra towels, but after even just one shower the mildewy smell returns. I know it is hard to keep towels fresh in the humidity. Thanks for the wonderful place to stay! We enjoyed our stay at Kanaloa 3601. The view was beautiful. It was a very well equipped condo, we lacked for nothing. We hope to stay again in the near future. Fabulous condo was in a great location for us. Away from the Kona core and steps away from Keahou Bay and a terrific little beach just outside the gates of Kanaloa. The view is a great combo of water and mountain. I didn't quite believe it on previous reviews but that's what it is. It doesn't look out over the vastness of ocean but has constant interest. A well appointed condo with all the stuff you'd need for a great holiday. Massive master bedroom and a reasonable second bedroom with 2 singles for our friends. The shared BBCue was a 1 min walk away and worked like a charm with no waiting. The oceanside pool was a gem. Twice we had friends visit and they were also very impressed...and envious. Well appointed shopping centre very close by which meant we didn't have to head into town except when we really wanted.We'd absolutely go back to this condo at Kanaloa. Fabulous! Our vacations are a joy when we stay with you. It is nice after a busy day adventuring on the island,to come “home”. We have stayed with you #3601, for two summer vacations and are consistently pleased with the accomadations. If our time permits, we plan on a repeat next year! Breath-taking views. Waves breaking on the shore was so relaxing. Exceeded our expectations. It was an excellent place to stay. I could have just sat on the lania the whole time. The unit was beautifully furnished and had everything we needed. Enjoyed all the beach-going equipment. The kitchen was fully stocked with spices, oils, etc. and all the equipment needed. We enjoyed the games and cards, viewed some videos, but did not take advantage of the CD's and player. The condo really has everything. I will certainly be booking it in the future. Oh, the grounds and pool areas were immaculate. My personal complaint was the the master bed seems to be in need of replacement. Hard as a rock! Didn't work for me. We have stayed at Kanaloa many times. This was our first experience In a ground floor condo. We were THRILLED with the well stocked unit, new floors in main areas and one updated bathroom, the view of the bay, the speed with which any enquiries were dealt with and we anticipate returning. Bedroom carpeting could do with removal or ‘refreshing’. Otherwise, a fantastic location and unit! Our family of 4 stayed in this condo for 5 days just before Christmas. The condo was clean and in great condition. The furnished lanai was wonderful -- the view was spectacular -- we preferred the bay + ocean view and view up the hill of this condo to the strictly oceanfront view that another family travelling with us had. The condo owners included several beach chairs, beach towels, and a cooler that we were able to use. Condo had plenty of dishes, pots/pans, coffeemaker, dishwasher, towels. Appreciated the special touches leaving us some basic supplies like tp, paper towels, laundry and dishwasher soap, etc. Condo owners also included a notebook of guidance and suggestions as well as a notebook of restaurant menus that were very helpful. Located in what seemed like a quiet condo complex where you could walk or run if desired. Very short drive to "the fishbowl" for snorkeling or "magic sands" beach as well as the beachfront of central Kona. Very nice oceanfront pool and jacuzzi we used which offered a great view of the sunset every evening, plus a separate adult pool (not oceanfront) that we did not use. Tennis courts available on site. We paid for the air conditioning to be on which was useful even though we were staying in winter (December). Would highly recommend this rental. This was our second stay in 3601, and our ninth trip to the Big Island. We particularly enjoy this complex for the balance of luxury and affordability. This unit has been upgraded since our last stay. The new floors and remodled bath are lovely. We have found 3601 to be nicely equipped with the lanai view being a big plus. The kitchen is always well stocked with spices and cooking items. A stop at Costco allows us to cook most of our meals for a week-long stay. I’d be cautious with the pot & pans as some inconsiderate guests have damaged the tephlone coating over the years. Our activities on the island includ snorkeling, scuba diving, zip lining (Hawaii Forest & Trail), star gazing on Mauna Kea (book the tour, don’t do this drive at night as the island is very dark after nightfall), and lounging. This complex has three pools. The ocean pool is incredible. In the event kids are at play and you wish for quiet, there are two other pool options incluing an adult only pool. Our reservation was handled as you would expect. No issues with check in our during our stay. We have stayed in many of the condos in this complex over the years, and 3601 is one of our favorites. Well appointed, clean, and nicely tucked into the bay with great views of the boats that come in early evening for the manta ray excursions. The location is also convenient to Kona, and activities north and south of Kona for beaches, snorkeling, and other sight seeing.The kitchen is well stocked for cooking which we enjoy doing after a day of activities.I would recommend this condo as a great deal! This is a terrific condo.Seating includes a sofa,recliner and a chair with an ottoman so lots of good choices. Kitchen chairs are very nice to get in and out of, Front bathroom has a newly redone and tiled shower that is very nice.Location has a beautiful view,This is our second time there and we would return. We thoroughly enjoyed our stay in Kona ,and will be back again.This is our third stay in the Kanaloa @Kona resort complex. Our condo was well equipped and felt like home when we walked in. The 24 hour security is a plus, really made my husband happy as he was unable to come on this trip. Our family has visited Hawaii many times and we've stayed in multiple condos. This is our favorite site ,and we certainly will return for another fun and relaxing vacation. Recently had our 3rd stay at this condo, and it never ceases to amaze us. The view from the lanai is spectacular. We eat all our meals there. Love the sights and sounds. Each subsequent stay here is longer than the previous one (2 weeks and counting!). Stocked with everything we need other than groceries. Owner and local manager are both very accommodating and make this such a pleasant experience. We highly recommend this property to our family and friends. We rented 3601for 35days. Very comfortable and large unit. Kitchen was well stocked and had pantry items galore. The bay view is better than direct ocean front and protects from hot sunsets that can heat up the house. Used a/c during end of trip, was muggy but was great in am. Grounds are super, Kaleo was wonderful helping us with things. Thanks Larry we will want to come back, aloha Pat. We stayed for 17 days ( still not enough time) we loved your condo. We have stayed at probably six or seven other units in the complex and yours was one of the nicest. I can't believe finally a condo with sharp knives. I like to cook and your kitchen was well set up. We had a problem with the sink but your manager was fantastic about getting a new faucet put in. All the views from the lanai were great. Watching surfers in the morning while eating breakfast. I tried to book for next year but it was already taken. We will book again thanks. Hate to share this secret! Our family had a fantastic vacation at Kanaloa, Condo 3601. The unit, view, and amenities were great and we look forward to visiting again. What a beautiful condo -- what a great visit. This was our second stay in this lovely condo. We love the view, we love the well furnished kitchen. we love relaxing in the evening with DVD's or with games. We had some great snorkeling at Two-Step. We tried the Farmer/Artisan market at the Sheraton next door. Great trip! Been going to Kanaloa over 30 years in different condos, this is one of the best!!! We very much enjoyed our stay! The condo was very comfortable and nicely stocked with all of the essentials. We loved the patio and the sounds of the waves along with the view and the ocean pool. We will definitely be back! My husband and I stayed at your condo for 10 days in july. Unfortunely that's also when a painting crew was scheduled to paint our condo. Come monday morning we had men at our windows scraping the wood and preparing for the days work. Next thing we knew they were on the deck. Needless to say we weren't happy with the lack of privacy and called the management to help. It took two days, but finally they left us in peace and came back on our final day there. The place needs some upgrading and the cockroaches were a problem in the master bath. I think we'll try a newer condo next time. We arrived on July 8, 2016 and there were signs up stating that building 3600 was going to be painted during our entire stay. When we walked up to the front door it was covered in paper along with the windows and the painters were in the process of painting 3601. Fortunately the owners representative was still in the condo and talked to the painters. We were assureds they would not be painting 3601 until after we left. Unfortunately the painters stored all their equipment on the side of our lanai and would start work at 8 a.m. constantly walking by the lanai. We were forced to keep the windows closed and blinds drawn during our entire stay to maintain our privacy. We couldn’t eat out on the lanai because of the loud noise, paint fumes and dust. One day they painted the upstairs lanai and enshrouded our entire lanai in plastic. The next day they started sanding our lanai. When I returned home I contacted the owner and asked for some compensation for the major disturbances during our stay and this was his reply: “During our time on the island in May a met with other owners who buildings had been painted. They reported that they were renting their units and their was only minor inconveniences to guests during the painting. We did recommend that if for any reason you were not happy with 3601 that you move to another unit and we would refund your money. You elected to stay in 3601 instead. Therefor we are not going to refund your money after your stay. “I was shocked because this never happened. We were never offered a move to another unit. He also disclosed that he knew the condo was going to be painted in May 2016 yet chose not to tell us! I can assure you I never would have rented his condo if I knew the building was going to be painted. I have asthma and the paint fumes and dust made it worse. No other guests were staying in building 3600 during our stay which makes me think those owners were honest and disclosed the painting to potential guests. As for the condo it is very dated. The Master bathroom is very dated and the shower door doesn’t close and the grout is in need of professional cleaning. The kitchen refrigerator door felt like it was going to fall off every time I opened it. The ice doesn’t come out the ice dispenser and the ice freezes. We were advised to use a hair dryer to melt the ice! The best part of the condo is the lanai. Unfortunately we were unable to enjoy it. There are other rentals in this complex. My advice is to choose another. The painters do not work for us. We did know that the building was scheduled to be painted in July but did not know the actual days the 3601 exterior was to be painted. Our island manager made every effort to accommodate these guests, including a refund if they moved to another condo. We can't say enough good things about our stay at 3601 Kanaloa. For us, it was just perfect and exceeded our expectations. We loved the view of the small bay, enjoyed listing to the crashing waves, and loved watching the activity of the distant harbor (which was an easy 10 minute walk from the condo). We could see the boats paddle out into the ocean, and there was just enough activity to watch to peak our interest, but at the same time be relaxing and it did not take away from the simple beauty of the water. The facility amenities were great with 3 pools, an Oceanside pool, adult pool and a 3rd pool we never got to try out. We even got to sit in the hot tub which was great. As far as the condo, we absolutely loved it. It was so comfortable, tastefully decorated, packed full of everything you could need for your vacation (a cooler, beach bag, beach towels, noodles and boogie boards). It really felt like home, only much better! The living area was spacious and the condo was well ventilated. The unit had a great cross breeze being next to the water, and we were just so comfortable. The only downfall was we stayed only 6 nights/7 days, and we really should have stayed at least 10 days. Once we got to the island there was so much to do, and it was such a wonderful place to stay we wished we stayed longer. I guess there is always next year! We really loved our stay here, thank you so much for sharing your great home with us. We stayed at Kanaloa for one week in April. It was a last minute decision for us and we were very pleased to find such a lovely place on short notice. 3601 has to be one of the nicest rentals at the resort because of the privacy and wonderful ocean views.With so much activity on the water with canoers and surfers, we were never bored. The condo was well furnished and very well equipped. Better than average for sure. The pools were quiet, sunsets glorious. Location near shopping centre , beaches and golf course, was great. I would definitely give 5 stars. This was the second time my husband and I have stayed in this condo. We like the open layout and quiet location. Our daughter and son-in-law joined us this time and they were just as pleased with everything. My husband likes the ice maker and I never moved from the lanai. The kitchen is well stocked and this year they added a TV in the master bedroom if you wanted it. We prefer the sound of the waves. We all plan on going back next year.I hate to give a review in case we cannot get a reservation. We enjoyed our stay at 3601 unit very much. The views from the living room was outstanding.The unit is very clean and has everything you need. Lots of extras like cooler, tupaware, local guides, beach toys that made things much easier. Very good location and close to grocery store.We highly recommend this place for those who like a peaceful vacation in a beautiful area.Thanks Larry for sharing your home. We stayed in this condo on vacation with our two young adult children, for 5 nights. The condo itself was beautiful - spacious and well equipped. The decor was homelike - truly lovely, not just make-do. It was like staying in a friend's place -- everything we needed was there: folding chairs and towels to take to the beach, a cooler; the kitchen had the things we needed for cooking; the ice maker worked. The view from the lanai is just as pictured, and we ate every breakfast and when we were home, lunches there. The resort pools looked great, but we preferred the natural beauties of Hawaii. There's great snorkeling a scant 5 minutes away at Kahaluu Beach Park. We also drove about half an hour to Honaunau Bay, which was even better. Our family also enjoyed the wi-fi, and the collection of DVDs to watch in the evenings. We hope to return -- I highly recommend this condo. This property was recommended to us by friends who had previously stayed in the unit and it did not disappoint. Kanaloa 3601 was clean, well appointed and convenient. The updated kitchen was well stocked with staples like spices, oils. Our favourite part of the unit was the lanai which catches the morning sun and has roller shades to keep the sun out if you like.We spent every morning on the lanai watching the boats leave the bay and paddlers explore. The beds were comfortable and the amenities in the complex were great. Our kids spent many hours in both the ocean and main pools. We had a wonderful week in Kanaloa 3601 and would return to it and recommend it to friend without hesitation. My husband and came to Kona to decompress after our daughter's large wedding. The condo sits away from the main hustle and bustle of the resort with a great view of the bay and the Sheraton and out to the ocean. We only left the unit to snorkel and to a church service. The kitchen was well stocked and I was really impressed with the quality of the knives; best in any condo we've stayed. Only wish that there was a hot pot or a tea kettle. Rooms are large and airy and enjoyed just doing nothing. It is really private and nice that you cannot see any other neighbors. We could not hear anyone on the second level. My husband was impressed with the ice maker. Most places we stay do not have ice. There is a paper box located near the main pool. Tennis courts are in good condition and the three pools make it convenient for everyone. This is our second stay in the resort and will return to this unit. This condo recently changed ownership. It was highly regarded when owned by the former couple, and the new owner has not skipped a beat. He is responsive, kind, and very helpful. We were due to leave the day that Tropical Storm Iselle was to make landfall. Our flight was canceled and we called to extend our stay. Mr Shook arranged for our extra day of stay and also had backup plans for another place to stay if our trip was further extended by plane issues. This particular unit is beautiful, very clean, and has all the extras that you'd want to enhance your trip. The view is incredible, overlooking a small bay. The sound of the crashing waves is music to our souls. The location of the complex is within walking distance of the piers where some great boat outings launch from. The employees on site were extremely helpful and kind. George, especially, was always someone we hoped to see at the entrance. This is my husband's and my third trip to the Big Island. This was, by far, our favorite place to stay. We will be strongly recommending Kanaloa at Kona, and specifically unit 3601. Following are some things you won't need to bring or purchase thanks to a well stocked home:High efficiency washing machine soap, boogie boards, any cooking or eating utensil you could possibly need, kitchen staples, and a cooler. There are games, puzzles, and movies to keep people occupied (especially parents while teen girls are primping--and teen girls while parents are sleeping!) The ceiling fans were quiet and very effective. I highly recommend the air conditioning in the summer (although we would personally get it no matter what time of year it was). I believe that if you're looking at condos then you are looking for a quieter and homier experience. You will not find a condo that fits the bill more than this one. Mahalo Mr. Shook and Kanaloa at Kona for making us feel like ohana!! Outstanding abode for a trip to Kona! This place was home for us for a week during our recent trip to the big island in October. The location of this particular condo is extremely convenient to the entrance, the pool and clubhouse,tennis courts, bbq grill, etc. The view of the bay just below the lanai can't be beat, and provides a nice breeze and the great sounds of the ocean just outside your door. The unit itself was fully stocked with everything you could need down to the smallest details- kitchen stuff, bathroom stuff, washer/dryer, laundry soap, shampoo, etc. you name it. just show up with your bags and enjoy! The beds were comfortable and the two twins in the 2nd bedroom slide together to create another king sized bed- which was helpful for my brother and sister in law who joined us. we had 4 people in our party and the condo was spacious enough for all of us. The one thing that could have been a bit better is the functioning of the a/C unit. It may need servicing. It seemed to have a mind of it's own, sometimes working, sometimes not, even with all doors and windows closed. Overall though- this place is great- beats the heck out of staying at a high priced resort. We're sorry that you had some difficulty with the AC during your recent visit. We came in two days after your departure and have used the AC ourselves almost every day since with no problem. It was last serviced May 2013, but we are having it looked at again anyway. For future reference our unit manager, Kaleo, may be called at any time there is an appliance malfunction. There is no charge for this service. We want our guests to enjoy a perfectly carefree vacation whenever they stay with us. Best rental of our vacation! We had a great stay at Kanaloa at Kana, at the end of a quite street with a guard stand at the entrance. The main pool is crystal clear & the area had a resort feel - ping pong & tennis court easily accessible. Covered parking, a bit tight if you have a big car, well maintained, clean & safe. Outside our unit there was fresh banana, lime & mango trees filled with ripe fruits. Booking arrangements where super easy - Chuck at aloha Condos did all the work & emailed us everything we needed to know. The condos are close to everything which is another plus. Unit 3601 was perfect. This is a large 2 bedroom, 2 bath, unit. There was nothing we could want for. The owners made us feel like family having had so many amenities available to us. The stack washer/dryer came in handy allowing us to pack lite, plenty of linens, pillows, towels (bath&pool;) in great condition. Laundry & dish detergent was available, showers had a fresh bars & liquid soap & shampoo/conditioners in the showers. The pantry had plenty of stocked food items that made cooking in the unit very easy without having to buy all the little ingredients. They have all kind of kitchen trinkets/gadgets availble to use - even a coffee grinder to grind the fresh coffee beans that came in a welcome basket filled with fresh local fruit, jellies & crackers. Seriously it was like renting from family with all the little extra's, they really go that extra mile. The floors &rug; where clean, furnishings all new, up to date with that tropical beach flair, the beds are very comfortable & the Wifi is lighting fast! Plenty of outlets to charge all our Iphones /Ipads at night. The Lani was just amazing with the view of an ocean cove, complete with a wet bar & ceiling fan, we could sit for hours listening to the gentle slap of the ocean and the breeze thru the palm trees. We chose to have air conditioning during our stay and it made us very comfortable especially to sleep. I would recommend this option if you stay in august. We enjoyed very much our stay in condo 3601 in Kanaloa at Kona. The condo is nicely furnished and extremely well equiped. We felt at home right away. We very much appreciated the gift basket with local specialties at our arrival as well as all the little extras like the list of restaurants, the snorkeling gear, soap, shower gel, shampoo, laundry detergent, etc. (other owners don't supply everything!). The view from the lanai is wonderful and we saw turtles while snorkeling in the little bay. The condo had a great view of the ocean. The condo was well equipped, comfortable and had a lot of extras that made our stay great. The washing machine with a little difficult to figure out how to operate. the condo property had great amenities and helpful a concierge. The property swimming pools were great. buy items that will only be used during the short time they are visiting. We’re awfully sorry our new washer and dryer gave you a hard time, though. It seems that today’s manufacturers love to dazzle us with new models that seem to require an advanced degree to operate. We do have a book of manuals of operation for all appliances and electronics in the unit. This is located on the kitchen shelf right next to other information books, or you could call Kaleo, our local condo manager. He would be happy to walk you through the process. He’s very good at answering any need or question you may have about our condo. Thanks for staying with us. The condo was exceptionally clean, comfortable and well appointed to accomodate our five-person family. The lanai overlooked a bay of the ocean and was a delightftul place to have breakfast or read and relax. The kitchen was well appointed and the dishwasher and clothes washer and drier were very useful. An amplitude of towels, renewed daily, and of beach towels were supplied. The whole area was secure and safe to walk around in and enjoy the pools and the beach. Condo 3601 in Kanaloa at Kona was great! You couldn't get a more picture perfect a accommodation overlooking a beautiful bay. The grounds, gardens, and pools were lovely and well-kept. The condo itself was very well-equipped with anything plus more that one would need for their vacation. The owners even left welcome gifts for us. The surreal sound of the ocean from the lanai was a comforting sound. We thoroughly enjoyed our stay at Kanaloa at Kona 3601. The condo and complex was everything we expected! The condo is exactly as you see in the video tour. It is beautifully decorated and immaculate. The condo is very private and even sitting on the lanai it seems as if the view is yours alone. It is plenty large for a family of four. The walk-in closets and large bathrooms were a bonus. Our girls, ages 18 and 21, commented that they loved the condo and location so much they would be willing to give up their separate rooms at home to live in this condo! Getting to the condo was easy thanks to the directions provided by Chuck. Check-in was a breeze. There was a wonderful basket of fresh fruit, jams, and Kona coffee from the local farmers market to greet our arrival. We can't even express how fabulous it was to eat breakfast on the lanai each morning and listen to the waves and watch the boats, kayakers, and snorkelers. Everything you could want is provided for in the condo and then some. In addition to all the snorkel and beach gear, there was a small ice chest and ice packs and even binoculars for taking in all the beautiful views. It was also very convenient to shopping, with a farmer's market on Saturday morning (there is another a bit farther on Wednesday). amenities at our condo so that our guests will really feel at home and enjoy their stay in Hawaii. Your review describing and appreciating so many of these features have made it all worthwhile. Perfect place to stay on the big island!! You literally stay right on the ocean. Has great swimming pools and is a great place for families and couples that don't want to stay in just another hotel. This condo has it all. Mellow atmosphere. Great location. Wonderful view with big surf sounds. Clean and well equipped. Nice pool areas. Everything you need for a perfect Hawaiian vacation. The condo is beautifully decorated and supplied. The location on He'eia Bay is wonderful. Couldn't ask for more. We'll be back! We're happy that you enjoyed your stay in our condo while visiting Hawaii. However, we regret that you were dissatisfied with the twin bed setup. Under "Features and Amenities" our website offers the option of having either twin beds or a king-size bed in the guest bedroom. Even if you had neglected to make your wishes know in advance, our local contact here in Kona would have been more than happy to convert the twins to a king had he been notified. When you plan your next visit you may indicate your choice of bed configuration in the guest bedroom on the reservation and have it ready and waiting for you upon your arrival. Stewart Berkshire, Owner Condo 3601. One of the nicest places we have ever stayed. The lanai is perfect! It looks like this is a quiet beach cove in the pictures, and I was so pleasantly surprised to realize that the waves crash in below the lanai loud enough to hear throughout the living area of the condo. We loved it!!! Everything was perfect. My husband, 20-year-old son, and I loved this condo. It is gorgeous and incredibly spacious. Every morning I came straight out to the living room to enjoy the view. I opened the sliding glass doors to hear the ocean. The owners have provided everything a vacationer might need. Aloha Condos is excellent as well. I will rent through them on my next trip to Hawaii. I can't tell you how wonderful this condo was. Everything was fabulous and could not have been better. We would absolutely return. Awesome! - would definitely stay here again. Great condo. Very clean, well equipped kitchen. All the amenities one could ask for. The lanai was so great to sit out and have our breakfasts and dinners. Couldn't have asked for more. Unit 3601had everything we needed for a comfortable and relaxing vacation. The beds were very comfortable. We did not need air cond. Pools were wonderful - the pool by the ocean is now open. We used everything - Bbq's, beach equipment, all linens (excellent quality), washer dryer, cooked over 1/2 our meals and sat on beautiful lanai, reference books - all was perfect! We are planning our trip for next year! We stayed here for a week celebrating our 50th anniversary. It was the perfect condo for us. It is located within beautiful grounds(my wife said it was like walking around in the Garden of Eden) with the lanai overlooking a small cove with the ocean waves breaking against the shoreline,sounds of a variety of birds,a quiet peacefulness, and private location.The condo is beautifully furnished with care and equipped with everything you could need or want.We would highly recommend. Thank you for calling our attention to these problems. Since your stay in condo 3601, the sink plug in the master bathroom has been re-connected. The defective part has been replaced. The flush mechanism is no longer a problem in the master bathroom. The toilets have been upgraded to new raised, water-conserving Kohler commodes. In the future, if there are any maintenance needs, please call our local contact person. He is very responsive and will arrange to have necessary repairs made immediately. As for noisy neighbors, some people arriving from the mainland or other countries forget that they are in a time zone that is different from where they live. This can happen in any resort area. Kanaloa has regulations restricting noise between 10:00 p.m. and 7:00 a.m. A call to Security will promptly summon someone who will politely inform the offending party. Thank you again for your comments, and I am glad that overall, you enjoyed the many amenities provided for your comfort in condo 3601. Thanks for making this wonderful condo available to us. It was perfect for two couples. It was clean, well-outfitted, and had a terrific view of the ocean. Aloha Condos made the financial part of the transaction easy. We have rented vacation condos from them in the past and have always been pleased with the quality of their service. loved, love, loved our week staying at this condo. we've traveled to kailua-kona several times and i'd like to start by saying the KTA grocery store up the hill has improved so much over the past couple years. you can get all sorts of local produce (much of it organic) and their prices are comparable; for the big island, at least. costco also has some great local stuff. that being said -- the kitchen in this unit was awesome! the appliances themselves all worked great (that blender was crazy! ), but more so the way it was furnished was the nicest part. there were herbs and seasonings and extra paper towels and jars of various condiments were actually left in the fridge! they supplied cleaning products and rags and dish, dishwasher and laundry detergent. there was every gadget imaginable (took us a week to figure out what the pineapple corer was)! we weren't left needing a thing. it's very rare to visit a condo that supplies all those extras. the comforts of home continued throughout the unit. it was very clean, and while it didn't feel brand new, it was super cozy. plenty of space for 3 adults and a toddling 1-year-old. i had inquired about a crib before our trip for the baby and some rental companies were referred to me. those places are ridiculously expensive so i decided to just have the babe sleep with me. the owners took it upon themselves to purchase a play yard for the unit, and charged us a very fair rate for it. the extras continued all the way out to the lanai with a gorgeous view, a mini fridge for all the drinks and a closet stuffed full of beach chairs, pool toys, boogie boards and even snorkel gear. this trip was one of the most relaxing so far (as relaxing as possible with a toddler under foot). the pool areas are nice, the water was a little cold, but refreshing at times. the grounds were very serene all around. i would definitely recommend this condo to a friend traveling to hawaii. we hardly left, and can't wait to get back! The Aloha Condos were all we wished them to be.Our condo was exactly as advertised on the web, clean, modern, fully equipped, with very comfortable amenities. Of course, our location overlooking the crashing surf in the cove directly across from our veranda made our visit even more rewarding. We loved this beautiful, large condo with a great view. The condo was very nice, large, and clean. The grounds and pool were very nice. The condo was quiet and well stocked with everything we needed. The local contact was very helpful in coming over right away on our arrival day to help us turn on the A/C which is operated on a key lock. The view was wonderful over the bay and we enjoyed the many turtles that were there (even more than at Turtle Beach down the road). The condo is in a great central location and I would definitely recommend it. I am a bit hesitant to write a review, for fear that the next time we want to stay here it will be booked. But to be true to the "aloha spirit", we have to say that this was one of our favorite places we have ever stayed. The condo is fully equipped with everything you might need (including some great books on local activities). It is also in a very quiet location, overlooking the ocean and a little bay where you can watch the surfers every morning while you drink your coffee. Hopefully we get back here some day. My husband and I stayed in unit 3601 for a week in December. Although it was just the two of us, we opted for this unit because of the view and proximity to water. It did not disappoint. The lanai was a perfect spot to watch the waves, and had us thinking we could go jump in the water. As it turns out, the waves break hard at this location, so it was not ideal for me as a beginner. But the beauty and sound were enjoyed throughout our stay. This home is obviously loved, and the stocked kitchen was greatly appreciated. All the pots, pans, and accessories you could ask for, not to mention the spices, oils, etc. This resulted in us saving a bundle on dining out, and resdiscovering how much we enjoy preparing meals. We enjoyed the free wireless internet, which, along with the books in the condo, allowed us to do some research each day to make sure we had our plans straight. It also allowed us to stay in touch with the folks back home. The tile in the home is orignal, and is the only dated feature. By no means does it require replacement, but it does show the guests the period in which the condo was originally constructed. We enjoyed the pools on site, especially the adult only pool, which we would escape to if too many kiddos were playing at the main pool. We did not order from the resturant/bar at the main pool. They were awaiting their liquor license, and were serving a limited menu. This was our second time to Kanaloa at Kona but our first time at this unit. It was very a relaxing stay...very quiet and private. We enjoyed our short 5 day stay and will definitely be going back for a longer period. This is a very well furnished, lovely condo. The view oc the ocean was fantastic, and so was the singing of the birds. We stayed here for ten nights, hoping to stay a lot more next time! It's unfortunate that our guest didn't receive the information sent to them or contact us before their arrival saying that they didn't know how to check-in to the condo. The check-in instructions were emailed 30 days prior to arrival, with a follow up reminder one week before arrival. Included in these instructions were specific details with directions to the resort, how to register with the security guard at the resort entry, and how to find and access this beautiful, privately-owned condo. Gaining access doesn't require using the Outrigger front desk as they only manage units in their rental pool. The information guide was inadvertently placed on a shelf in the kitchen with other helpful guide books. These include appliance directions and menus from recommended restaurants and cookbooks. It is boldly labeled "Kanaloa Info". Aloha Condos does not charge the guests for necessary services, including unlocking a thermostat. Guests can, and do, call and receive prompt and courteous personal attention for any concern they may have. 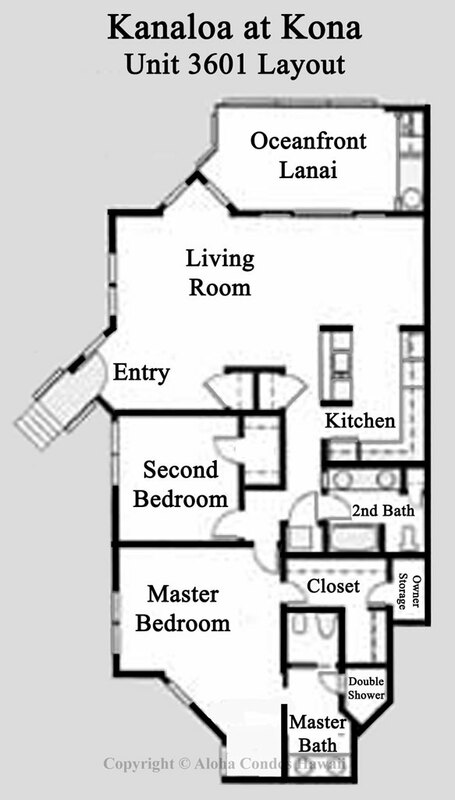 The floor plan is clearly shown on the website. Guests often comment on how they enjoy the spacious size (1500+ sq ft) of this unit, including the conveniences offered by the layout, not to mention its beautiful location on the little bay. This review is quite unique and a surprise to us. The owner met the tenants when he came to turn on the A/C control and once again, as they were leaving. Both of these encounters were very cordial and complimentary in nature, with no complaints expressed. We feel very fortunate to have received more 900 FlipKey reviews and thousands of verbal complements on how Aloha Condos truly conveys to our guests the Aloha Spirit that makes Hawaii a wonderful place to be. A great place to stay on the Big Island. It had everything we needed. It was comfortable and away from town. We had a view of the ocean and complete privacy. We recommend it 100 percent. Thank you.